Last Friday CIDR ran a workshop with the MA Information Design course, investigating the visualisation of natural hazard and meteorological uncertainty information. A fictional design scenario was used for the day, along with a series of mocked-up forecast documents, representing the forecasts on an alien planet for the alien meteorological phenomenon ‘sludge’. The challenges of communicating the uncertainty attached to the sludge forecast were explored though group sketching and discussion. 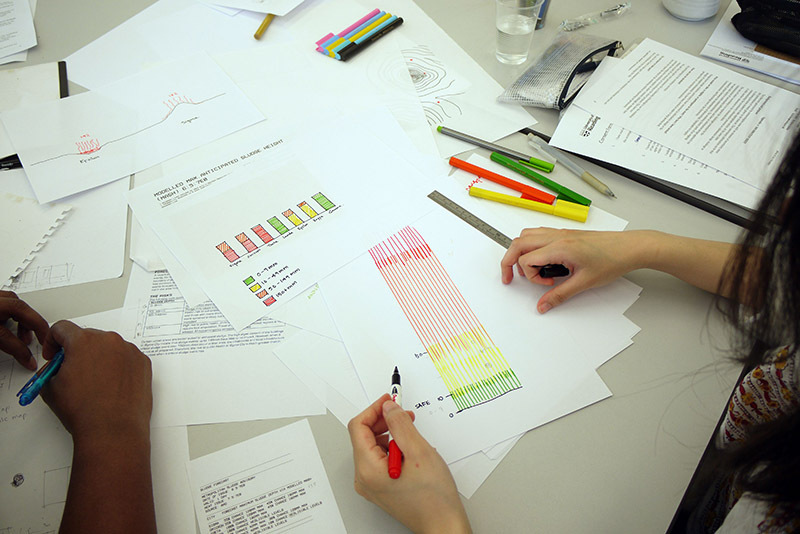 A wide range of ideas were generated, including charts, graphs, and maps, targeted at a selection of different user groups. The workshop forms part of CIDR’s collaboration on a multidisciplinary research project, RACER, on the communication of the risk and and uncertainty of extreme weather events. We were joined by Kelsey Mulder from the department of Meteorology, who gave a presentation on the meteorological context for uncertainty in weather forecasting. This entry was posted in Afterword, Research, Teaching. Bookmark the permalink.